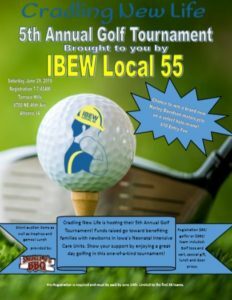 Join us for the 5th Annual Cradling New Life Golf Tournament Presented by IBEW Local 55 scheduled for Saturday, June 29th at Terrace Hills Golf Course in Altoona, Iowa. It will be a day filled with fun and prizes benefiting families with infants in Des Moines Neonatal Intensive Care Units. Test your skills for a chance to win a Harley Davidson Motorcycle, put your bid in for the silent auction items and/or try the Claxon’s Dart Golf Challenge. Registration starts at 7 a.m. The cost is $90/person or $360/team which includes green fees, cart and lunch for the 4-person best ball tournament. Trophies will be awarded to the top teams. Help us make this year even better than last year while helping families of little ones in the NICU! Pre-register your team by entering the information below and sending in your registration fee to Cradling New Life, PO Box 3407, Des Moines, IA 50316 by June 1, 2019. Singleton Package – Hole sponsorship for $100. Twin Package – 3X4 Banner on the course as well as a hole sponsor for $300. Triplet Package – Table advertisement at luncheon, banner, hole sponsor and logo on t-shirt for $550. Quadruplet Package – Sponsor one golf team, table advertisement, banner, hole sponsor and logo on t-shirt for $900. Quintuplet Package – Sponsor two golf teams, table advertisement, banner, hole sponsor, booth space, logo on t-shirt, and your choice of 1) Trophy sponsor 2) Hole prize sponsor for $2,000. Please fill out the payment information below notating the package that works best for you! We are looking for volunteers to help out the day of the tournament to make everything go smoothly. If you would like to volunteer, please fill out the form below and let us know if you would prefer to help with registration, tournament games or lunch.